LG Optimus G Pro smartphone to debut eye recognition technology | What Hi-Fi? 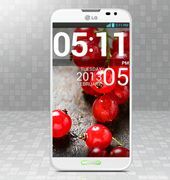 Electronics firm LG is set to unveil two new multimedia features by introducing Smart Video, and the world’s first Dual Camera function, with its forthcoming Optimus G Pro smartphone. LG claims that Smart Video, similar to Samsung’s rumoured ‘Smart Pause’ feature in its upcoming Galaxy S4, will eliminate the need to manually control playback. Recognizing the position of the viewer’s eyes, playback will be paused when the user is no longer focused on the display. Playback is resumed once the viewer’s gaze returns to the video. In addition the Optimus G Pro will also be equipped with a Dual Camera function. This will enable simultaneous capturing of pictures using both the front and back cameras for a picture-in-picture composition. Both Smart Video and Dual Camera features will be introduced to the Korean market next month, with some LG Premium smartphones to be shipped with them in the future. Sneaky timing from LG – perhaps in an effort to steal some of the thunder fron Samsung and its Galaxy S4 unveiling today.